Bookmarks lost during Firefox refresh ? This is how they can be recovered. 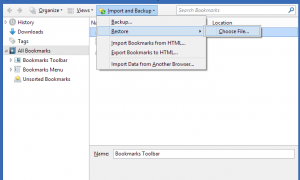 This is a simple procedure that shows how to recover lost bookmarks from Firefox. They can be lost if Firefox crashes unexpectedly or for any other unexpected reason. Ok, you did not create a backup. 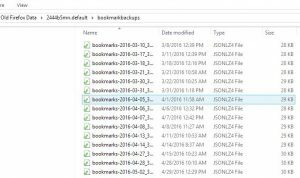 But Firefox did the backup for bookmarks for you. If you are lucky and you should be, since Firefox creates this folder if possible, in case of a crash, on Desktop you can find several files with Firefox bookmarks backup. You can use one of these to restore. It might look like this picture and you can select any of the files. Of course, you might want to select the most recent file that contains Firefox bookmarks backup.